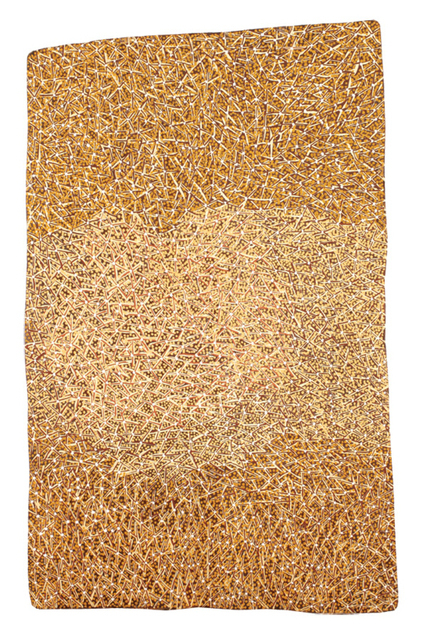 This artwork was part of a fundraising auction Ochre: Supporting Indigenous Health through Art at Mossgreen Auction House, Melbourne Australia in 2008. Gulumbu explained that some stars (ganyu) are special for Yolngu. This painting refers to but does not specify two ‘dreamtime’ stories, which represent different constellations that the artist was told about by her father as a child. Her father was Munggurrawuy Yunupingu. The author’s ‘little brothers’ are Galarrwuy and Mandawuy Yunupingu. She retells the stories for children of the new generation. She also paints them. When she looks at the stars, Gulumbu thinks about the universe, all around, and about every tribe, every colour. In every corner of the world people can look up and see the stars. This is Gulumbu’s vision – in her art, she focuses on the link between all people everywhere. The link between people on earth and stars in the sky – it’s real.